In-form Real Madrid have now won six of their past seven games, having drawn 1-1 with Barcelona in the Copa del Rey semi-final first leg on Wednesday and this deserved derby win moves them to within five points of La Liga leaders Barca. 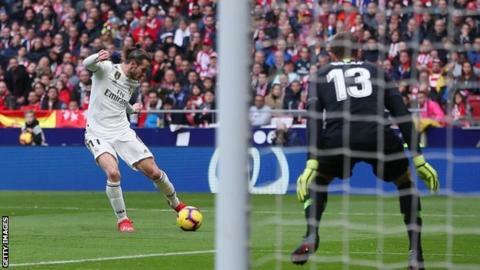 Santiago Solari’s side opened the scoring when Casemiro was left unmarked and he sent an acrobatic volley flying past Jan Oblak as Atletico failed to clear a corner. Atletico levelled as Griezmann chased onto an Angel Correa through-ball to slot under Thibaut Courtois, who had toy rats thrown at him by Atletico fans. The Belgian spent three seasons on loan at Atleti from Chelsea earlier in his career. But Ramos scored his eighth penalty of the season to restore Real’s lead after Vinicius Jr had been fouled by Jose Maria Gimenez. Four of his previous seven had been ‘Panenkas’ – chipped down the middle – but this time he drove the ball into the bottom left-corner. Vinicius was replaced by Bale in the second half and the Welshman smashed a low shot beyond Oblak for his landmark Real goal in his 217th game. Atletico were lacklustre as they conceded two goals in the first half of a home game for the first time since moving to the Wanda Metropolitano in 2017 – and the fastest in La Liga at the venue. Griezmann’s goal, their one good moment of the game, came after a long video assistant referee delay, but he had timed his run perfectly. Atleti had thought they had levelled for a second time when Alvaro Morata, facing his former club, chipped Courtois brilliantly from outside the box – but the VAR team correctly ruled he was offside. Atletico had been unbeaten in 19 games before his loan arrival from Chelsea, but have lost both matches with him in the team. A red card seemed inevitable for Diego Simeone’s side, who had six players booked and it eventually came when Partey fouled Toni Kroos for his second booking. Match ends, Atlético de Madrid 1, Real Madrid 3. Second Half ends, Atlético de Madrid 1, Real Madrid 3. Substitution, Real Madrid. Mariano replaces Karim Benzema. Foul by Karim Benzema (Real Madrid). Attempt missed. Gareth Bale (Real Madrid) header from the centre of the box is just a bit too high. Assisted by Karim Benzema with a cross. Attempt missed. Saúl Ñíguez (Atlético de Madrid) right footed shot from the right side of the box misses to the left. Attempt missed. Vitolo (Atlético de Madrid) right footed shot from the left side of the box is high and wide to the right. Assisted by Nikola Kalinic. Vitolo (Atlético de Madrid) wins a free kick in the attacking half. Substitution, Real Madrid. Dani Ceballos replaces Toni Kroos. Delay in match Toni Kroos (Real Madrid) because of an injury. Second yellow card to Thomas Partey (Atlético de Madrid) for a bad foul. Foul by Thomas Partey (Atlético de Madrid). Foul by Vitolo (Atlético de Madrid). Attempt blocked. Karim Benzema (Real Madrid) right footed shot from outside the box is blocked. Assisted by Lucas Vázquez. Attempt missed. Rodrigo (Atlético de Madrid) header from the centre of the box is just a bit too high. Assisted by Antoine Griezmann with a cross following a corner. Corner, Atlético de Madrid. Conceded by Lucas Vázquez. Goal! Atlético de Madrid 1, Real Madrid 3. Gareth Bale (Real Madrid) left footed shot from the left side of the box to the bottom right corner. Assisted by Luka Modric. Attempt missed. Karim Benzema (Real Madrid) header from the centre of the box is high and wide to the right. Assisted by Daniel Carvajal with a cross. Saúl Ñíguez (Atlético de Madrid) is shown the yellow card for a bad foul. Sergio Reguilón (Real Madrid) wins a free kick in the defensive half. Offside, Atlético de Madrid. Santiago Arias tries a through ball, but Nikola Kalinic is caught offside. Substitution, Atlético de Madrid. Nikola Kalinic replaces Álvaro Morata. Vitolo (Atlético de Madrid) wins a free kick in the defensive half. Álvaro Morata (Atlético de Madrid) is shown the yellow card. Foul by Álvaro Morata (Atlético de Madrid). Hand ball by Álvaro Morata (Atlético de Madrid). Next Story → Gareth Bale scores 100th Real Madrid goal – so why is his career under a cloud?